The Champaign County Economic Development Corporation (EDC) was established in 2001 to lead job creation efforts in Champaign County. The EDC is a private/public partnership organized to continually improve the local economy by successfully driving business attraction, retention and expansion. EDC brings together private and public sector community leaders for the common purpose of ensuring a robust economy for Champaign County. Champaign County, Illinois is located in East Central Illinois, where US Interstates 57, 72 & 74 intersect, approximately 2 hours south of Chicago; 3 hours northeast of St. Louis; and 2 hours west of Indianapolis. 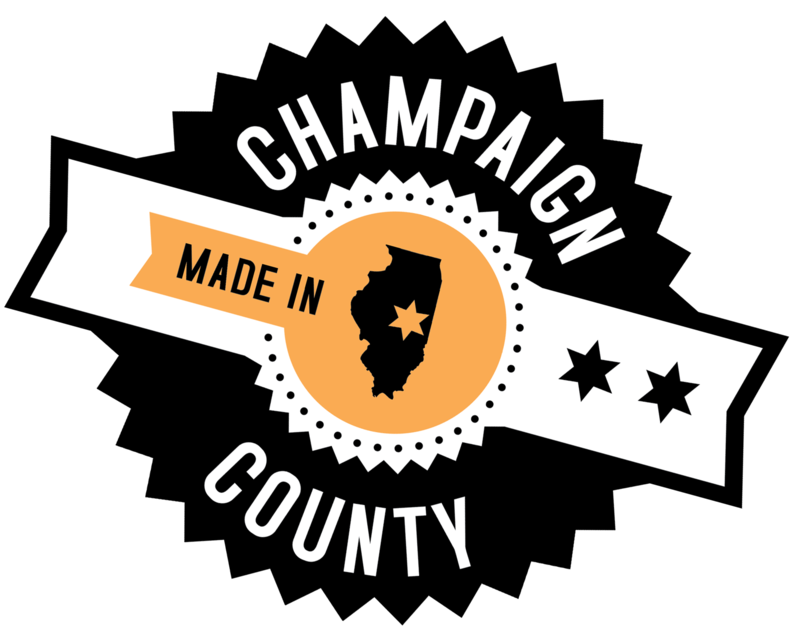 Home to the University of Illinois, Parkland College, and two major regional hospitals, Champaign County is a leader in education, health care, government, high technology, manufacturing, distribution, and agriculture. Champaign County comprises 1008 square miles, the majority of which are involved in agriculture, with Champaign-Urbana as its micro-urban core. The population is 201,081, with the largest urban areas in the City of Champaign (81,055), the City of Urbana (41,250), and the Village of Rantoul (13,674). Home to one of the world’s great public research universities; Champaign-Urbana possesses an uncommon set of attributes normally associated with much larger metropolitan centers. Among these are a vibrant arts/culture/nightlife scene, an internationally diverse population, a strong technology base, and a palpably animated public discourse on major societal and global concerns, such as sustainability and the environment. The size of the community also provides advantages such as ease of transportation, more affordable living, and a stronger sense of community, creating benefits over a more logistics-laden lifestyle associated with densely populated urban centers that can often diminish, rather than enhance, quality of life. Champaign-Urbana is home to Nobel Prize winners, Olympians, critically acclaimed international film and music festivals, world-renowned entrepreneurs, elite chefs, a major marathon, the newest and most powerful supercomputer in the world, radical transformers of the Internet, one of the nation’s elite public high schools, leading environmental scientists, the world’s premier university-based performing arts complex, numerous inventions that have changed lives for the better around the globe (the first web browser, the MRI, the transistor, sound-on-film, light-emitting diodes – to name a few), museums, a leading local food cooperative and local foods movement highlighted at the Urbana farmers market, and a long line of distinguished artists, scientists, and innovators. Large multi-national corporations with operations located in the community include examples such as Kraft, Yahoo, Intel, Caterpillar, THQ, Abbott, Littelfuse, FedEx, Flex-N-Gate, Solo Cup, Conair, Sony, Jeldwen, and many more. Our community founded and has retained headquarters for success stories including Wolfram Research, Jimmy John’s, and Flex-N-Gate. Kraft has the largest food manufacturing facility in the northern hemisphere located here with more than 1,400 employees. Our community is also an innovation leader for new startup activity including more than 100 small technology firms. Our Research Park was named the Outstanding Research Park of 2011 and our technology incubator was recently named to a top ten list by Forbes and Inc.com. The President is the Chief Executive Officer of the Champaign County Economic Development Corporation, an important community leader and builder of positive relationships throughout Champaign County, and exemplifies trust and integrity. The President and CEO is responsible to the EDC Board of Directors. The CEO will provide the leadership necessary to develop and successfully implement economic development strategies and initiatives for Champaign County by quickly earning credibility, respect, trust and confidence of people throughout the County. She/he will take the lead in building partnerships and programs with higher education and regional partners to foster a climate of collaboration and growth that benefit the local economy. The CEO will be a strategic visionary thinker who is able to set sights on a new future, constantly identifying the challenges, threats and opportunities that exist in a changing environment with the leadership skills, experience, and tact to manage the continued growth and sustainability of the organization. He/she must have the ability to generate support from others to achieve the desired outcome in a planned and strategic way, especially in situations where there is no clear ownership. The CEO should have a history of generating support by successfully engaging, partnering and building alliances with a wide range of constituencies and influencers that includes business leaders, economic development partners, elected officials and the media. The CEO acts as the primary contact and facilitator for business retention, expansion and recruitment in Champaign County. He or she develops, coordinates and updates programs and strategies to identify, respond to and attract new business. The CEO is expected to direct the program of work that supports lead generation for new business opportunities and the execution of a strong retention & expansion program with companies, area manufacturers and suppliers. She or he must possess strong skills in selling the merits of Champaign County that result in attracting new jobs and investment. The CEO must have knowledge and experience with business location and expansion decisions as well as business start-ups, entrepreneurship and sources of business capital particularly in the areas of manufacturing/distribution, medical/bio-tech, technology and professional services. He or she should have the ability to focus on achieving positive, concrete results that benefit the local economy by displaying a passion for Champaign County and the ability to overcome challenges and develop opportunities. The CEO will be recognized as the voice of Champaign County EDC and the champion for private sector investment in the community, maintaining high visibility by promoting the objectives and successes of the organization before funders, government agencies, community groups and the public; and further expand the organizations influence at the local, state and federal levels of government. He or she will have excellent verbal and written communications skills as well as experience developing and implementing a comprehensive communications strategy. The CEO must have experience utilizing and responding to the media to effectively deliver the appropriate message to the wider community. She or he must be an effective public speaker, have an understanding of social media and possess effective public relations skills. The CEO should have prior experience reporting to and working with a Board of Directors to establish strategic and tactical plans and utilizing performance metrics to measure the progress and success of these plans. Must have the ability to ensure alignment within the organization so that the Board, staff and volunteers are working towards the same goals and that they understand any changes in direction. Should have demonstrated success in the day to day management of an independent organization with a track record of being able to execute on key commitments and deliverables within defined time frames. She or he should be committed to developing the staff to their fullest potential for the benefit of the organization including discussing development needs with employees and providing them with opportunities, visibility advice and coaching. Must have prior executive level experience developing and managing budgets, financial reports, financial analysis and P & L statements. Experience managing government grants is desired. Administer human resource functions as set by Board policy and corporate by‐laws, including the direction of the work and hiring all employees of the EDC. He or she will guide collegial interactions among the people and systems of the organization. The CEO must have the ability to ensure ongoing financial support for the organization by articulating the strategic vision to the both public and private investors. The CEO must have the experience and ability to work with a number of local governments with both shared and varied interests and the leadership skills to engage the business community and local government officials in a functioning and vital public-private partnership. Should understand the role of local, state and federal governments in the economic development process and to understand the impact of public policy decisions on business growth and advocate accordingly. She or he should be a networker that builds productive and collaborative relationships with individuals and organizations both inside and outside the economic development field and maintain a wide network of contacts that can be leveraged on behalf of the community. The CEO will understand the role that a variety of interest groups such as unions, private investors, utilities, education and under-represented groups can play in the economic development process and successfully engage them as stakeholders in the success of the EDC. He or she will have the ability to identify issues that impact initiatives and approach each issue with a clear perception of organizational and political reality. The new CEO can anticipate the establishment of mutually agreed upon performance standards with the Board at the time of hiring. Within the first year, the President is expected to establish an effective working relationship with the Board, partner organizations, staff and the community. Membership in community service groups, as well as continuing professional education and professional memberships may be budgeted as an expense of the EDC. The Board expects the CEO to reside in Champaign County and become an active participant in the community. The President and CEO serves at the pleasure of the Board of Directors. After screening and qualification by the Search Committee of the Board, the final candidates will be invited to Champaign County for introductions and an interview with the Search Committee. Background investigations will be conducted as part of the selection process. The resumes and all application materials will be kept confidential throughout the selection process. Graduation from an accredited college or university with a Bachelor’s degree in business or public administration, Economic development, finance, economics, planning, or related field. A Master’s degree and CEcD (Certified Economic Developer) is desired. Demonstrated continuing professional development as evidenced by completion of seminars, certification, workshops and training programs to stay abreast of the economic development field. Participation in professional development activities at the state and national level. In-depth knowledge of the principles and practices of economic development. Experience in a high‐level community leadership role including five to ten years’ experience in an economic development capacity or other relevant executive level experience. Significant, seasoned professional business development experience and skills. Success in research, planning and implementation of business development marketing with measurable outcomes. Success in carrying out strategies for business retention; providing value and support to existing employers. Experience with successful university relations in fostering technology transfer of research to entrepreneurial business opportunities. Record of reducing barriers and fostering cooperation between multiple employers, business organizations and governmental agencies. Financial acumen, including agency administration and familiarity with local and state government budgeting processes, grants and incentives for business development. Demonstrated experience in strategic planning, performance measures, process review and project management. A strategic thinker, experienced in planning and executing complex marketing plans and development projects involving many partners in the public and private sector. An entrepreneurial builder who embraces new ideas or innovations. A manager with full appreciation of the value of effective delegation and accountability. An inclusive leadership style in the organization and the community, respectful of individual’s efforts and roles, and comfortable with team‐oriented approaches. An understanding of the importance of positive public relations, including communications with the news media, the business community and local government. Ability to foster enthusiasm for the organization among Board members, staff and partners, both current and prospective. Curiosity, creativity, courage, competence, communications, character, conviction and common sense. Proven track record of successful leadership with an organization of impact/influence. Ability to appropriately persuade and influence others to achieve a common goal. A person of unquestionable integrity and ethics; one who can be trusted. A person of vision who can guide economic development with a global perspective while respecting the Regional resources and people of the Champaign County community. A dynamic individual with the poise to promote partnerships and opportunities among developers, property owners, businesses and investors that are local, national, domestic or foreign. The personal strength to seek and accept mutually beneficial agreements or outcomes; the confidence to promote win/win solutions among business and community leaders. Dedicated to becoming an active member of the Champaign County community, with respect for its values, history, assets and potential. The ability to form strong, mutually supportive working relationships with the Board and staff members. Desire to be seen and be active in community affairs, to join groups of his or her interest and to establish rapport with businesses, property owners, investors and residents. An outgoing individual who builds strong relationships with Board and community leaders, businesses and staff members. Willing to accept constructive, critical advice from the Board, staff and partners on development and leadership issues. A sense of humor, tenacity and optimism about the economic development process. For consideration, please submit letter of interest, résumé and professional references to search@champaigncountyedc.org no later than close of business Friday April 20, 2012. EOE. All submissions are confidential.